"These truffles have been a family favorite for over 30 years! The almond extract and the butterscotch chips make a wonderful rich flavor when melted with the semisweet chocolate chips. If you're looking for a treat to take to your next holiday party, this is it! Place truffles into containers to store and keep refrigerated. If giving the truffles as a gift and needing to stack them inside a container or tin, cut waxed paper the size of the container or tin and place the waxed paper on top of each single layer of truffles." Melt condensed milk, chocolate chips, and butterscotch chips in a saucepan over medium-low heat. Stir frequently until smooth, about 4 minutes. Remove from heat; add almond extract, stirring until well mixed. Let cool in pan until no longer hot, 5 to 10 minutes. Refrigerate until set, about 1 hour. Fill a small bowl with confectioners' sugar. 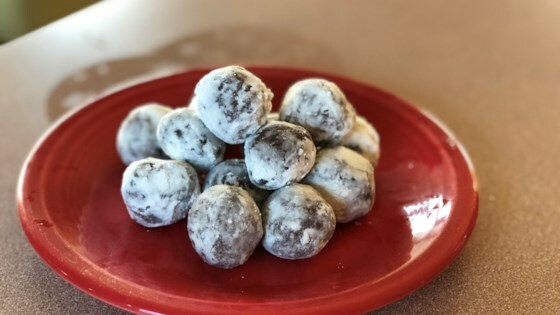 Remove chocolate mixture from the refrigerator and roll into quarter-size balls. Drop truffles gently into the bowl of sugar and roll until well coated.